Church bulletins and newsletters... surely, every church has one? Large or small, no matter who does it, a church bulletin is what keeps members “in the know” about what’s happening. The problem is, far too many go unread. Thrown in the corner, left on a lonely pew, or smashed in the back of a Bible, never to be seen again. Then the church office gets flooded with calls from people wanting to know dates for the Women’s Retreat or what time their kids need to be at choir rehearsal. These type of calls are probably a church secretary’s biggest irritation. Well, don’t shoot me for heresy, but dare I say that it may not be just the members’ fault. Uh oh. I mean, sure there are just some things that must go in it. I get that. The key is presenting your information in such a way that people actually read it. You know this about yourself… you have tons of information coming at you 24/7. You are constantly on a tight schedule. Who has time to read a 5-page bulletin? What most people do with church bulletins is SKIM them. So… that means you have to prepare your bulletin with that in mind. No worries… help is here! So why aren’t they reading it?!?! If you know why your church bulletin isn't getting read, you can do what it takes to get them to read it. So how do you turn your church bulletin from drab to fab? 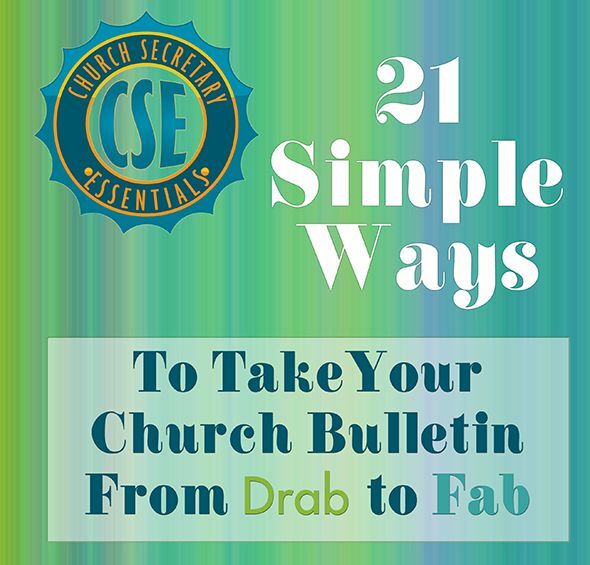 In my action guide, 21 Simple Ways to Take Your Church Bulletin from Drab to Fab, you'll find the number 1 reason people don't show up or respond to important items and events you share in your bulletin. I also give you the 3 things that get your church bulletin trashed... #1 being there's nothing on the cover that's compelling enough to get me to open it or keep reading and #2, I can't actually read it... small fonts, blurry images will make folks toss your bulletin to the side quicker than you can blink! I talk about critical mistakes that diminish the value of your bulletin and how to avoid them as well as how to include content that compels and captivates your readers. It's an ACTION guide that's packed with useful, actionable tips from beginning to end... Grab yours today and take your church bulletin from drab to fab today!